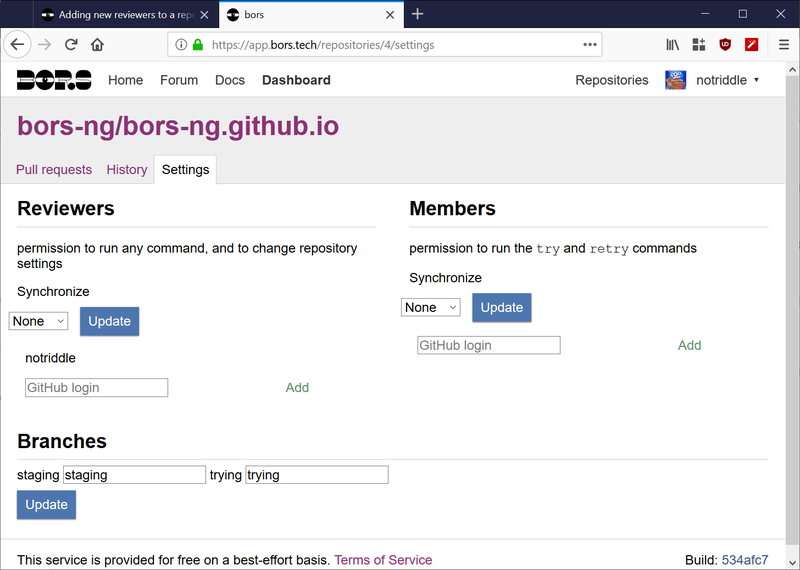 When you add a repository to bors, it will automatically add you as a reviewer to it, giving you permission to run commands like bors r+ and bors try on pull requests on it. To add or remove someone else on this list, you will first need to Log into the dashboard. If you are not using the public instance, please ask your organization owner what the URL for your instance is. If you are using the public instance, it’s https://app.bors.tech/. Next, go into your repository list. After opening the right repository, choose the Settings tab. Next, type the username of the person who you want to grant into the “GitHub login” box, which is placed next to the list of existing users. Then hit Enter. If you entered a valid GitHub username and all goes well, the user should now have permission to issue commands. Otherwise you’ll see an error describing what went wrong. This screen is also where you can set bors up to sync the set of reviews from GitHub permissions. Set the “Synchronize” drop-down. Can bors-ng automatically grant reviewer permissions based on github permissions? I have a project with ~25 repos × ~50 committers and both are growing all the time (you can see why I’m looking for automation!). Can bors-ng automatically grant reviewer permissions based on github permissions? Yes, it can. This screenshot was a bit out of date, so I updated it.